This could also be the first hydrogen Lexus we see on the road. The Japanese auto industry, one that has benefitted heavily on the widespread adoption of crossover SUVs, is now pointing its sights on another profitable segment: the factory-built performance car. These cars check off the targets of commanding a higher list price that's pocketed as profit, keeping more money under the umbrella of the automaker rather than being funneled away by tuners, and giving performance credibility to a brand that could use a bit of spark to liven up an otherwise dull lineup. Citing a patent filed by Lexus, Auto Guide reports that the LS become exactly this sort of car for Toyota's luxury offshoot. With Nissan placing renewed emphasis on Nismo and the proposition of a BMW M4-beating Q60 from its luxury brand Infiniti, it appears that Japan once again sees the value in horsepower no matter how high or low in the range it's delivered. After having released the Lexus LS F Sport at last month’s New York Auto Show, a filing for the name LS-FC Concept may hint at a full-on track-bred version of Lexus’ flagship sedan, one that could give the Mercedes-AMG S63 a headache if done right. After using the LF-FC Concept name to show off the new LS earlier this year, the LS-FC name could abbreviate the LS-F Concept moniker. While we could never be counted amongst the haters of this idea, we think it would be a bit far-fetched to expect this to happen without first seeing a dedicated F-tuned version of the LC coupe. Lexus’ flagship grand tourer would be the most obvious recipient of a high performance F variant, but with reports directly from Toyota claiming that it won’t happen, it seems unlikely that the LS-F would be on the table. 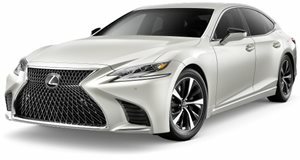 In its defense, an LS-F model would have two things going for it over the LC-F. First would be the fact that it's likely to sell more strongly than the highly niche LC Coupe. As tuners like AMG and BMW M are beginning to note, demand for sports cars will always be there, but demand for high performance combined with utility could soon surpass that. Second is the fact that Akio Toyoda, president of the Japanese automaker and a notable gearhead and lead-footed race car driver, recently voiced his desire for Toyota to make more cool cars. However, an alternate theory proposed by Motor Authority claims that the LS-FC Concept name may highlight a hydrogen fuel cell version of the LS sedan, a likely alternative given that Toyota is one of the few automakers fervently pushing towards the power source instead of battery electric powertrains. If that's the case, a successful luxury sedan powered by fuel cells could do to the hydrogen can what Tesla did to the battery electric car. We'll have to wait and see which way history will skew, but in either case it appears that Lexus is poised to change the game.